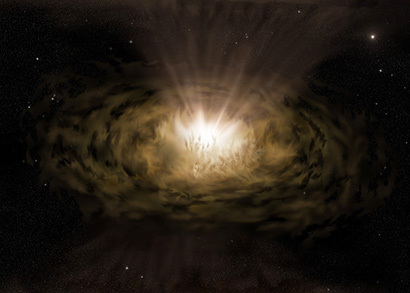 An artist’s impression of what an active galactic nucleus might look like close up. The accretion disk produces the brilliant light in the center. The broad-line region is just above the accretion disk and lost in the glare. Dust clouds are being driven upward by the intense radiation. Citation: Partial dust obscuration in active galactic nuclei as a cause of broad-line profile and lag variability, and apparent accretion disc inhomogeneities.